Being aware of technology and expanding our network is so important to being able to effectively and efficiently accomplish our work as information professionals. Attending and participating in ABA TECHSHOW is an opportunity to increase knowledge and awareness of the topics and tools in legal technology. As a result, when I was selected as the CS-SIS Vice Chair, I proposed that my vice chair project include expanding opportunities to attend ABA TECHSHOW. The CS-SIS Executive Board has provided support for this endeavor by establishing a travel grant for ABA TECHSHOW. The application deadline is January 4, 2019, so don’t delay! We set the deadline early so that the grant recipient can register in time to take advantage of the early bird registration pricing. You may be wondering how, after attending ABA TECHSHOW, you can get more involved. I certainly did. I would suggest that you join the ABA Law Practice Division. With the ABA staff, LPD is responsible for organizing ABA TECHSHOW. By joining you also get a discount on ABA TECHSHOW registration. You might also consider proposing a program for the next ABA TECHSHOW. Submitting a proposal doesn’t ensure that you will be selected to speak, but it doesn’t hurt. I always watch the LawSites Blog to make sure I know when proposals are being accepted. Also, I try to look at blogs and articles, like the one I co-authored here, to ensure my proposal ideas are not dated. This year I submitted several proposals. While the proposals were not selected, the TECHSHOW Board invited me to speak on other interesting topics, including document management with a really great co-presenter, Bryan Sims. If you are interested to see who is serving on the TECHSHOW Faculty this year, follow the link. 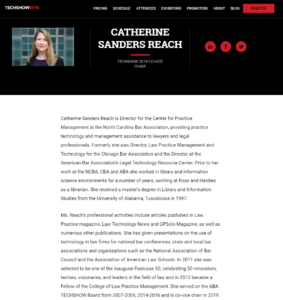 You may note that Catherine Sanders Reach, a former law librarian and co-vice chair of ABA TECHSHOW 2019, is a member of the TECHSHOW Faculty. 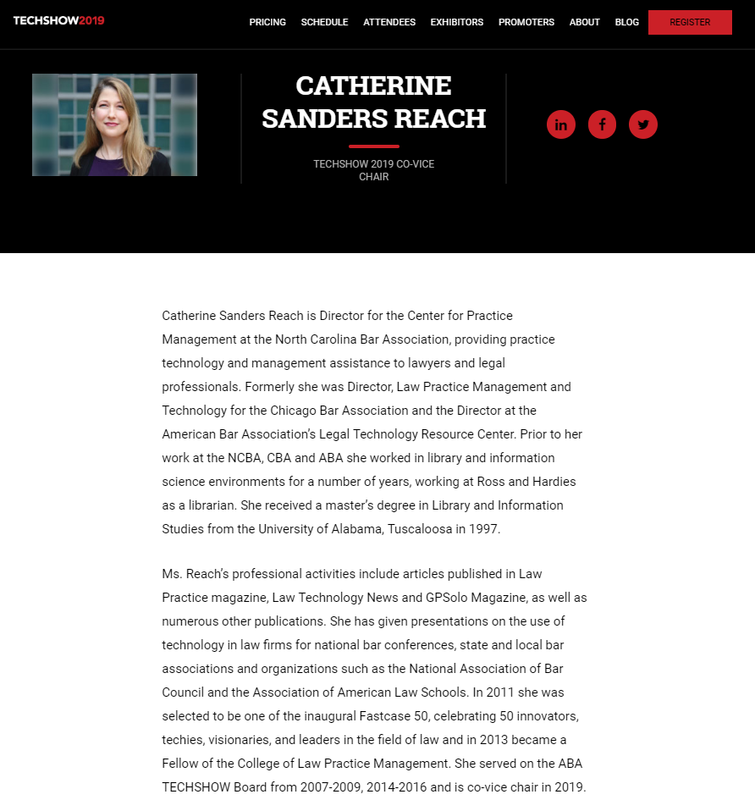 Catherine knows people and technology and, in true former law librarian fashion, is generous in sharing her knowledge. Take advantage of the opportunity to apply for the CS-SIS Grant! If you are not a CS-SIS member, consider joining! The CS-SIS is always looking for new members dedicated to serving all the information needs of their users with the aid of developing technologies. 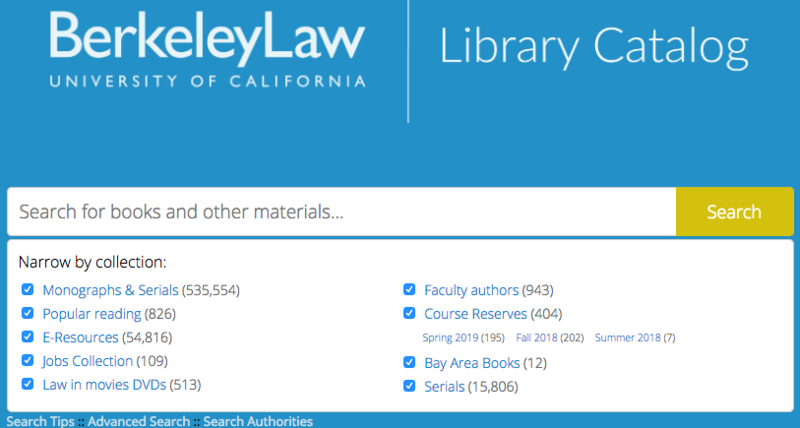 Editor’s note: After reading the press release announcing UC Berkeley Law’s selection of a brand new ILS, we reached out to the folks at UC Berkeley Law to tell us more about how this transition happened and how the new ILS compares to their old one. 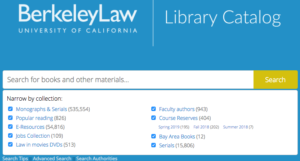 Thanks to Christina Tarr, head of the Cataloging Department at UC Berkeley Law, for this blog post. We were contacted in September, 2016, by Kathy McCarthy, who had formerly been our Sales Consultant at Innovative and is now the Vice President for Partnership Development for TIND. TIND offered us “ a unique opportunity to work closely with a small group of talented developers to shape an ILS platform to your individual needs. And likely at a much lower cost than what you are currently accustomed to,” and we took them up on it. In August 2018 we went live with TIND. We had not been actively looking for a new ILS, but when contacted, we found that we were ready to make a move. We’d been with III since the early ’90s when we were one of Innovative’s first customers, and I think TIND offered us now what III had offered us in the ’90s – a new and modern approach to doing our work. Some appealing things about TIND are that it is new and modern. While Sierra felt like a tank – a specialized but rigid vehicle well suited to doing our work, but with perhaps more horsepower than we needed, TIND is more like a Toyota – light, flexible, and more fuel efficient. For example, because it’s web-based, lists are simple to create, and we no longer need to save lists in a special place. We now just save URLs for searches. In Sierra, of course, we could export lists to excel, or export records to MARCedit and reimport them, but in TIND it’s quicker and easier, and patrons, without our intervention, can export lists of records themselves to Excel, and can easily update their patron records. It’s lighter, and more flexible, and yes, less expensive. There are drawbacks. TIND built an acquisitions system based on our workflow, and they are still working out some kinks. We appear to be their first real research library client, and there are things, like the lack of a browse feature, that gives us pause (although they have committed to adding this feature). Statistics are not yet as robust as they were in Sierra. Still, I think we are glad we’ve made the change. The flip side of having no browse feature is that searching is great – basically, you can search for anything that’s in the record, you don’t need to use indexes, and you can combine any element. Moving has also caused us to rethink our workflows, and there are things we felt we could not do without that we have now happily forgotten. The collection feature is handy for all sorts of purposes. We like the clean, uncluttered design. The authorities system promises to link headings and authority records in a modern way. We have managed, in TIND, to straighten out our item and patron types in a way we never could in Sierra, though that was probably our fault. And that may, in fact, be part of it – it’s probably not a bad idea to switch systems every now and then, just to reassess messed up workflows that you have been living with for years because you didn’t realize you didn’t need to. Overall, we are pleased with our new ILS and really appreciate the customer service provided by TIND. Take a look for yourself at lawcat.berkeley.edu. Do you support a virtual business meeting for CS-SIS? Based on survey results in August, members strongly support moving our CS meeting to an off-site venue. As such, the Board is looking into venue and timing options in DC. The survey results were not as definitive on the issue of changing our annual business meeting to a virtual format that would be held before the AALL conference. This change would require an amendment to the bylaws, so the Board would like to get more responses from the membership before pursuing this option for 2020. Additionally, the Board needs more information from you to plan the off-site meeting and social event that will take place at the 2019 AALL conference. The 2019 Schedule-at-a-Glance is now available for your review. Please help us plan for the future by filling out a three-question survey by Tuesday, November 27th. Thank you! What’s the publication date of the latest McKinney’s statutory compilation in print, or the equivalent published by Lexis? I need it for Bluebook citation. One possible answer to the reference question is to simply refer the patron to Rule 12.5 and not bother with print publication dates. However, I was curious if this information was available on either platform. The question of print publication dates continues to arise from law review students, and I wondered whether the information was available, not just for New York statutes, but others as well. Unlike the United State Code, which I know is published every six years with annual cumulative supplements, there is no easy way to tell how often state codes are published and whether they follow a main volume/supplement publication schedule, or are published irregularly. Yes, I could visit publisher websites and consult state legislative pages to find this information, but it is not expedient. The short answer is that print publication information is not available on either platform for state statutes. But should it be? Neither Westlaw or Lexis publishes their statutes online as they appeared in print, so while providing the print publication date would make it easy to cite to the print version of the statute, if the print version is different than the statutory text appearing online, the trail would be hard to follow as to which statutory text was actually relied on for citation purposes. There is no way on either Lexis or Westlaw to tell what statutory text appeared in the print versions. Is this different than cases? The Bluebook does not require reported case citations to contain which electronic database was used (the rule is different for pending and unreported cases) to find the case. While law review students may still ask for the print version of a reporter, it is widely accepted that the Westlaw and Lexis versions of reported cases are authoritative and the print version does not need to be consulted. With cases, the date that matters most for citation purposes is when the case was reported. Statutes, on the other hand, require dates for currency, and the ability to tell what laws were in force when. While both Westlaw and Lexis provide historical statutes, there is no indication as to what was included in the print versions. All of this is to say my answer to the reference question is two-fold: 1) print publication information is not available on either platform for state statutes; and 2) Rule 12.5 should be used for Bluebook citation of the statute. In a cursory look at law review citations to statutes, it’s clear that Rule 12.5 is not being widely used; are authors/editors really using print versions of state statutes during cite checking? I’m dubious this is true. The Bluebook acknowledges the use of electronic databases for statutory citation, and it gives the okay to rely on those database providers to provide statute currency; therefore, Table 1 of The Bluebook should be reflected to include examples of citations to electronic databases, rather than using the print compilations as their primary examples. As many libraries no longer carry print statutes, the primary citation format for statutes will be to the electronic database version, and Table 1 should provide examples for ease of use. 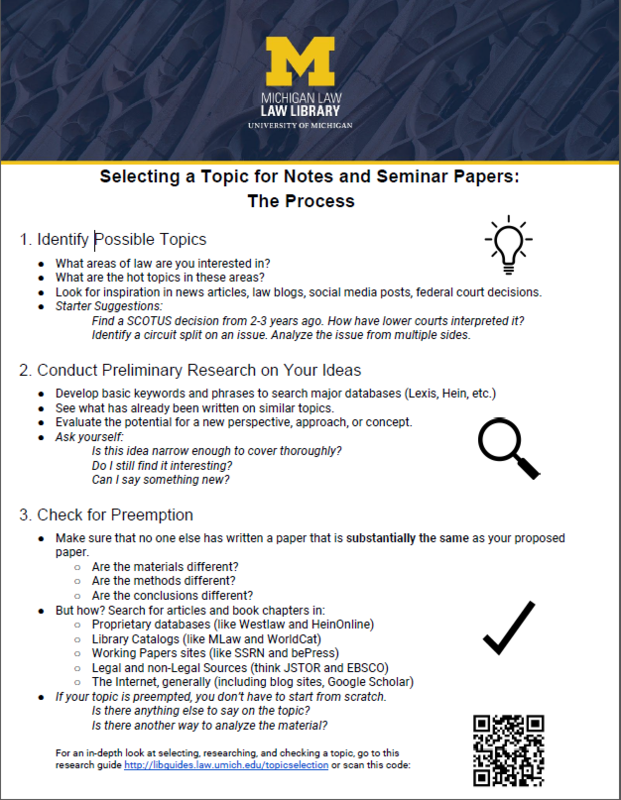 The following post is authored by Reference Librarian Kate Britt (University of Michigan Law Library). 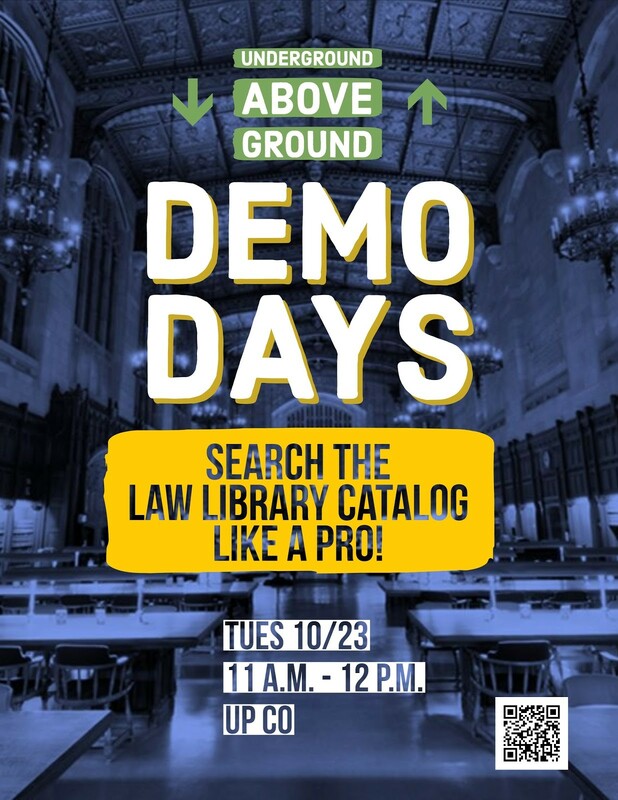 The Underground Above Ground series consists of one-hour demonstrations or outreach events (respectively called “Demo Days” or “Hey Days”) held in the hall outside the main student commons area. In order to choose time slots for these events, we compiled a spreadsheet of when every class lets out, rounded roughly to the half hour. If several 1L classes let out on Tuesdays at 1:55, 2:10, and 2:20, for instance, we may schedule a demonstration for Tuesday from 2-3. Our pacing in this inaugural semester is one to two events each week. After collecting and discussing many ideas for content, the librarians decided on about a dozen topics to demonstrate throughout the semester. We attempted to coordinate the content with students’ general needs. For example, in the second week of classes we presented bullet journals as an organizational tool; two months in we shared strategies for selecting a seminar paper or journal note topic; right before exams we will promote our collection of study aids and other study guide materials. For each Demo/Hey Day, we reserve a table in the hall and arrange to have a monitor and laptop available. Presenters create a handout that summarizes the demonstration content and has a QR code that links to a relevant research guide, webpage, or other resource. For most demonstrations, presenters will create a slideshow that loops on the monitor. These slides both highlight the major points of the demonstration and catch students’ eyes. For the demonstration on our Wellness Collection, the monitor simply showed relaxing nature scenes as an oasis for weary souls. Additional materials on the table vary from session to session. Often the content of the session dictates the spread: bullet journals for bullet journaling, study aids for study guides. Most of the time we provide a snack, like donuts, candy, bananas, or trail mix. We also put up signs to alert oncoming foot traffic to our demonstration. One of the many lessons we took from the AALL 2018 presentation on Lightning Lessons was to grab students with an inescapable question. “Do you want to learn about study aids?” Absolutely not. I’ll keep walking. “Are you taking any hard classes this semester?” Well, yeah. What do you have to say about that? Sometimes it takes a few tries to nail a good intro question, but once you’re asking the right question you don’t have to depend on student interest to bring them to the table. Once the students realize we are not trying to sell them anything, they usually show genuine interest in the information. In the midst of presenting, we are also tasked with recording statistics for each demonstration. We have a template on which we tally students who look at the material but don’t interact, students who ask questions or talk with us, and faculty interactions. At the close of the hour, we count how many handouts were taken (we start with 20 and have only run out once). We have a common spreadsheet to input statistics. In addition to the previously mentioned numbers, we record the date, day, time, snack, and presenters, in case we can identify any patterns. Every attempt has been made to align Underground Above Ground materials with the Michigan Law brand. The handouts and slideshow use consistent headers created by the communications department. We work with the school colors, fonts, and logos wherever possible. More exciting for our purposes are the ways we’ve created a library-specific brand. The Underground Library is identified in the series title. 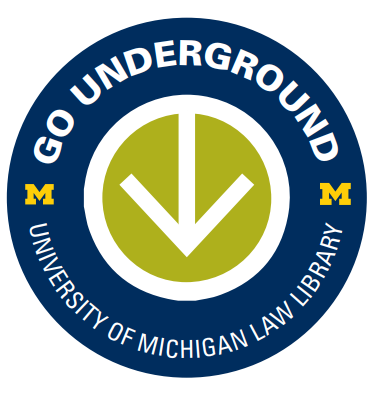 “Underground Above Ground” is also between two arrows (one down, one up), drawing on our library slogan Go Underground ↓. Our real calling card involves the distinctive green carpet in the Underground Library. We use green in slideshows and promotional material. We even purchased a green tablecloth to use for each demonstration. The color stands out from the Michigan maize and blue, and immediately identifies who we are. Demo Days are promoted using flyers posted on bulletin boards across the school and in the library. We have recently entered the social media realm with Law Library Twitter and Instagram accounts, which we use to promote events a few hours before they begin and while they are in progress. Visitors to the Law Library homepage will also see the next few scheduled Underground Above Ground events, scheduled using LibCal. The online home base for the series is a LibGuide. This guide includes a listing and short description of upcoming demonstrations. Once an event has passed, the event’s box moves to a second page, where the event is described in more detail. Associated handouts, slides, images, and other relevant links are also added. This makes it easy to share the information with students who were not present at the demonstration. Promotional flyers include QR code links to this page, and social media posts also send students to the LibGuide for more information. As stated at the outset, our two major goals for this venture are library outreach and increased awareness of resources. Regarding outreach, we are certainly becoming familiar faces to students who otherwise don’t visit the library. While it is difficult to measure intangible successes, there seems to be more recognition between students and librarians, general goodwill toward the library, and a breakdown of the barriers historically enforced by our location. Our statistical record-keeping is still in the early stages. Since we are largely testing the waters, we are uncertain what the demonstration stats will tell us. In time we will also consult the library usage stats we’ve always kept–reference transactions, resource usage, etc.–and perhaps be able to track whether any upticks coincide with demonstrations. 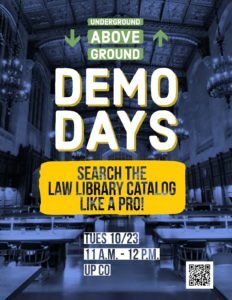 So far we are happy with the successes of the Underground Above Ground series, and we look forward to growing positive relationships with the students and greater law school community with each Demo Day. A few weeks ago, I was lucky enough to present at the WESTPAC annual meeting in Anchorage, Alaska, on separating the reality from the hype when it came to blockchain technology. Blockchain is somewhat ubiquitous in the news, and I can understand a rolling of the eyes and tuning out when you hear the word. The Financial Times has even referenced blockchain technology as a belief system. My disbelief and, to be honest, annoyance at the kind of blind enthusiasm is why I decided to do presentations on blockchain. I found the responses to my WESTPAC presentation heartening. Most people were interested in both what it really was, and in the different varieties of applications I mentioned during my presentation. a) There’s no one location for it, it lives on every computer that accesses it. b) It uses an appended structure – it adds on, it doesn’t overwrite when it adds new entries. c) It’s supposedly immutable – once entered, the content can’t be altered in that entry. However, subsequent entries with contrary information can be added. So what would that be good for? What would be the likely uses? The most well known is its use to facilitate cryptocurrencies, such as Bitcoin. It would prove useful for anything where you want a permanent, chronological record. So what kind of things would that be? Evidence – Chain of Custody – this is almost a no-brainer application as most chain of custody logs take the form of a long list, signed with each movement of a piece of evidence. Supply Chains and Payment Systems – This is at the heart of many blockchain applications and is the one that may appeal the most to librarians, especially when it comes to Interlibrary Loan services. So what else are people using it for? Beef.io – Ranchers in Wyoming entering their cattle into a blockchain for supply chain management. U.N. World Food Programme – At a refugee camp in Jordan, the United Nations is using blockchain in combination with biometric eye scans to ensure that the distribution of food to refugees is done in a way that discourages corruption, both on the part on the distributors and the recipients. AP Moeller-Maersk – the shipping company is using it in their marine insurance contracts. J.P. Morgan – JP Morgan is heading up the Interbank Information Network, which is conducting speed tests on non-“run of the mill” payments between over 75 banks. Storj – Distributed ledger cloud storage. – Essentially, your documents live on no one central server, but everywhere, on a distributed ledger. Launching in 2019. Golem – Instead of offering data storage, it offers distributed computer power. Need more RAM? Get it from a blockchain. OpenBazaar – A marketplace designed on Etsy and Ebay, combined with AirBnB, accepting cryptocurrency payments. Chronicled – This is probably most interesting in terms of legal application; essentially, it’s records management through a blockchain. Gem – A company working with the CDC to track disease vectors through a blockchain. MedRec, SimplyVitalHealth, CoMEHeRe – three of a number of efforts to track medical records through a blockchain. Provenance, VerisArt, and Blockverify – all track provenance of items/art/documents through blockchain. Estonia – putting its public records on a blockchain (you can be an e-citizen!). Arcade City – An Uber/Lyft style ride share company facilitated through blockchain. La’Zooz – Coordinates empty seats with passengers. Ujomusic – Tracking and distributing music royalties. Webjet – Tracking and trading of empty hotel rooms. CryptoKitties – Virtual pets. Yup, virtual blockchain kitty cats. That all sounds really cool, but what are the weeds you speak of? I titled this post “Varietals and Weeds” for a reason. I said that blockchain has been described as a “belief system.” Well, in that belief system, I’m somewhat of an agnostic/heretic. There’s some reason not to believe the hype. Sometimes when people say “blockchain,” they don’t actually mean it. For example, a company called Primalbase purported to have a “blockchain-enabled co-working space” in central London but it wasn’t blockchain-enabled. Then there was the tea company that decided to change to being a blockchain company, but not really. It’s overblown. It may not be as secure as it purports to be, plus it’s not always appropriate. “’Blockchain technology’ means distributed ledger technology that uses a distributed, decentralized, shared and replicated ledger, which may be public or private, permissioned or permissionless, or driven by tokenized crypto economics or tokenless. The data on the ledger is protected with cryptography, is immutable and auditable and provides an uncensored truth.” (Emphasis mine). Uncensored truth. The idea that the legislature is saying something is unequivocally true bothers me on a number of levels, not just in terms of technology. I have deep reservations about the the belief in a technology as a arbiter of truth and panacea for all that ails us. Yes, blockchain may be useful for ILL, authority records, linked data, the semantic web, and a number of other things. Yet now, more than ever, when data in a blockchain is considered by some as sacrosanct, data curation is of paramount importance, and that is where librarians come in. I tend to think of this as the need for discernment – discerning when the technology is appropriate, discerning what the data the technology contains needs to look like, and perhaps most importantly, discerning how we make decisions based on this technology. This may put librarians in a better position than ever to influence and contribute. Guest posts from CS-SIS members are encouraged; please contact the blog editor, Debbie Ginsberg, at dginsberg@kentlaw.iit.edu. It’s often hard to prioritize the special interest sections that cover all interests, and at $20 a section, the fees add up. The Computing Services SIS would like to make it a bit easier to join sections by sponsoring 25 CONELL participants with a 2018-2019 section membership grant to CS-SIS. There is a string attached, however. We’d like the grant recipient to join a committee. Committees are at the heart of CS-SIS, and joining a committee is the best way to network and to help move CS-SIS initiatives forward. Are you a newer member of AALL interested in joining CS-SIS? Or do you a know a newer member who might be interested? If so, please fill out the form or share the link. Only 25 section membership grants will be awarded, so sign up soon. Direct questions to CS-SIS Chair, Tawnya Plumb. Guest post by David Whelan; originally published on David’s own blog. When you weed – deselect – from a collection, you are focused on a particular audience. No-one can keep everything. I was looking for an album to stream over the weekend and was amazed to find it unavailable. Deselection can also mean that weeded content, by being out of sight, becomes out of mind as well. It makes me wonder how often library users realize what’s missing. I almost did an eye roll when I saw Southern Methodist University law library’s collection described as having dead books in it. I worked at the Underwood Law Library right out of law school and, while I didn’t spend much time in certain parts of the collection, I’m not sure I’d call any of the books dead. I think the writer was doing the dead trees thing but perhaps it’s passé. Items that are in a collection have always seemed to me to be like an object with potential energy. A lack of regular use isn’t a value reflection; it retains the same value it had when it was selected. If it’s remained on the shelf, it’s probably got some value to impart. And if it is weeded, it may not be a value reflection either; there may be something better, or a library just needs shelf space. In a digital environment, the assumption may be that everything is available, and so a search is comprehensive. I know that’s not true in law, although maybe not all legal researchers do. I expected more in music, although now I’m not sure why I had that expectation. In my case, I was just looking for the soundtrack to Amadeus, the 1984 film starring Tom Hulce and F. Murray Abraham, among others. I have the vinyl LP record but I was going to stream just a selection, figuring it would be easier than relocating to the record player. The movie won a ton of awards, so I figured the soundtrack would, similarly, have enough profile to live on digitally. Google’s listing of awards won in North America and Europe for Amadeus. Wrong. I couldn’t locate the soundtrack on Apple’s iTunes. Nor on 2 other music services I use. 7Digital brought up nothing. Google Play responded in a typical Google way: we know you’re looking something that involves these two people, but we’re not going to show it to you. Sir Neville Marriner conducted the orchestra that played on the Amadeus soundtrack. But Play doesn’t have the soundtrack itself. Then I thought of Spotify. Surely Spotify would have it! Sort of. To paraphrase Lou “Blue Lou” Marini, “that green Play button is greyed out on purpose.” I saw a small message at the top that warned me to come back later, that Firefox was installing something to play DRM content. But when I restarted the browser – and tried in Edge – the button stayed unplayable. I can’t stream Amadeus, that much is clear. I can probably find a Youtube or other copyright-violated online version. But the failure of the immediate access promised by digital music services struck me. If I really wanted to listen to this music, I’d have to fall back on other formats. Toronto Public Library has 4 copies of the soundtrack. That was the nearest copy to me in a library to which I had borrowing privileges. I could put one on hold and have it forwarded to the nearest branch. Could be a week or more. I could order a copy online. Amazon has one for about C$22 and could deliver by tomorrow. For those privileged enough to afford it, you can see why Amazon has a potential for replacing libraries who base value on delivering specific formatted content. Whether from the library or Amazon or some other store, a CD format would eventually become a digital format for me. I don’t listen to CDs much; my collection is mostly just an archive now. Or, since I was fortunate enough to own a vinyl copy, I could plug my Ion record player into a computer and, using Audacity, make my own digital copy. I’ve done it in the past and it’s a bit of a hassle but it’s not impossible. It’s how I copied my parent’s LP called Feux Follets, a 1960s era Canadian folk dance and music ensemble. I’ve never found that anywhere else. This is not the first time. I was looking recently for the heavily bagpipe-reliant soundtack to The Navigator: a Medieval Odyssey. The score lines up a bunch of European and Middle Eastern bagpipes with other instruments; it’s an interesting mix, but not for everyone. Before that it was German Brass, a group that’s been performing since the 1970s with a changing line up. And the Cambridge Buskers, a novelty act from the early 1980s. I have to admit that I occasionally buy something in a format that I expect will soon not be available. A copy of Millbank, an 1871 novel, or Pa’s Green Book with the information on the awk, two books mentioned in Laura Ingalls Wilder, have both been acquired and added to our family’s library. Not because they’re great literature but because the Little House books meant something to us and those books are part of it. It’s like the 1950 limit set on the Google cases. The all-encompassing nature of digital content suggests comprehensiveness. Libraries fight an uphill battle trying to challenge information retention based on format. At the same time, the shift to digital resources leaves both gaps, like Amadeus, or arbitrary cutoffs, like Google, that make the lost information invisible. Case law at least has the benefit of citations. If no-one links to or talks about the Flying Lizard’s version of Money, no-one will know it’s missing. The last copy networks that are being created by libraries are one way to capture the big things. Whatever the criteria, it’s a way for groups to take responsibility for keeping things of value even when there are good reasons to get rid of them. That’s great for the object but I’m not sure it’s as great for the user. Toronto Public Library has an LP version of the Cambridge Buskers 1977 release but it’s reference only. It’s preserved but it’s out of sight and, probably, out of reach of many people. That’s not a criticism; that’s reality for preservation. In the legal world, books can backstop some of this. But that they exist doesn’t mean they’ll be used. It’s not a value judgment. It’s knowing that, beyond the edges of the visible map, there are other worlds that could be explored. Unfortunately, not everything can be digitized. Even more content that can is unavailable due to licensing and other issues. Those are realities too and they are part of the perspective that everything is digitally available. We can’t always know and communicate what’s comprehensive and what’s missing. Even when we can, and provide information in different formats to fill gaps, it may not be meaningful. The friction required to go beyond what the publishers and aggregators provide is probably more than most people will attempt. At some point, I expect the perspective is that, if it hasn’t been made available, then it isn’t necessary. Find David on Twitter @davidpwhelan⁩ and be sure to check out his blog.